Q. Two wins after two losses, how relieved do you feel right now? WAQAR YOUNIS: Look, of course, I am relieved. There is no doubt about that but yet the tournament is still very open. We came to do well against the South Africans. Of course, this victory will definitely give us a boost, at least, a positive thinking toward the next two games. Q. The composition of the playing wicket, has it been quite an issue, and is it something that you've perhaps even struggled with some? I think going back six months or so you were adamant on playing seven batsmen and you wanted to blend in the batting, but then we had to bring back the bowlers. But now there are people who still feel Pakistan perhaps by keeping Sarfraz out and not keeping Nasir, how do you explain his position with the team now that he's got a tally of five runs in three games and a number of dropped catches and missed fielding and stuff? WAQAR YOUNIS: Look, we have 15 here, so we try to pick up the best side on a day. So if it's Nasir, or Sarfraz or Younis or someone else comes, whatever we feel is the right combination, that's how we go about it. Yes, seven batters, I still feel that Pakistan do need an extra batsman in the lineup, but unfortunately our batsmen are out of form, and we're not really getting what we were looking for from the seven batsmen. So it is kind of -- you have to give it somewhere. Either you give it in the batting or the bowling, so at the moment we're giving in the batting. But I still feel that Pakistan needs seven batters. Q. Can you just tell us something about Irfan what happened to him? Is it something to be concerned about or was it just a moment? WAQAR YOUNIS: Look, I don't think it's a major concern, but he's definitely got issues with his gluts. Hopefully it will be fine for the next game. Q. Are you, first of all, are you optimistic for the long-term future of Pakistan cricket, and following on from that, what could the ICC and World Cricket community do to help Pakistan? 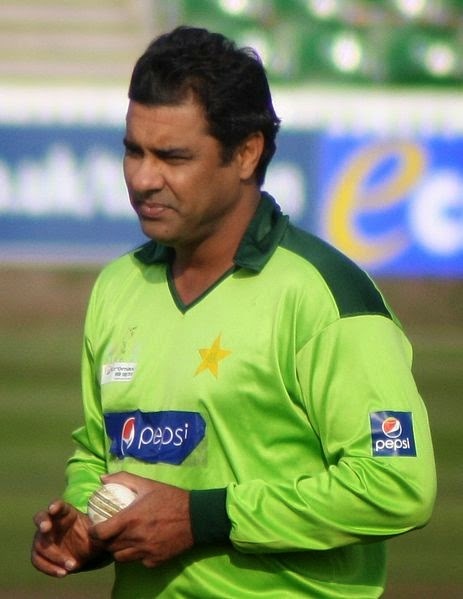 WAQAR YOUNIS: Look, to be honest, I'm honestly at the moment thinking only about the World Cup. Yes, Pakistan definitely need teams to come to Pakistan. That's what I think the ICC or the world cricket again can help us out in restarting cricket back in Pakistan. I think that will help. Yes, it is a big loss, huge loss for Pakistan that cricket is not being played in Pakistan. Of course you can see the symptoms, and that is the help of, I think I can ask the cricketing world. Q. Now you have two wins in the last two games. How satisfied are you by how things have been out in the field? You also got 340 runs, but it seems that it's not there. Would you take these kind of wins right now? WAQAR YOUNIS: I'll take it at the moment, yes. Q. And then hope the team sort of picks up? WAQAR YOUNIS: If you're looking at different teams, I think teams have picked up. You can clearly see India picking up very late. Teams like South Africa lost badly, started picking up, so that's what we're hoping, and hoping that all these boys who got runs today and carry on with it. I think the crucial game will be South Africa. Just not only to qualify, but also just for a morale booster we'd need to beat a top team to sort of get our confidence back. Q. It seemed like (Indiscernible). WAQAR YOUNIS: Yeah, of course we can. Every team has done it. We have done it in the past also. It's not something that I'm asking for too much, so we have beaten South Africa in South Africa, so we're definitely capable of it. Q. We've seen a tournament dominated by the batsmen. You were a great death bowler. If you were bowling at the end of the innings now with four men outside the rink, what would you be doing? Do you think bowlers could be doing that? WAQAR YOUNIS: I'm glad I'm not playing that. Q. Do you think bowlers could be doing more at the moment? WAQAR YOUNIS: It is a little unfair to faster bowlers, I would say or to any bowlers especially when the field is you don't really know which way to bowl. Yes, death bowling I feel that, still I feel the yorker is the best ball. They have different theories from different coaches coming down and asking for balls, short balls, use those square fielders. But I still feel the good yorker is the best delivery. Q. Is One-Day Cricket a less interesting game because they've weighted it so heavily in favor of the batsmen? WAQAR YOUNIS: Well, it's an entertaining world, I guess. And people want to see big sixes and all that and that's why the rules and laws have been changed in the recent past. The wickets have become really flatter, and the batsmen are a lot fitter and the bats are thicker. So there are a lot of things going in batters' favour. I guess it's a crowd pull thing. But for me, I believe it should be an even contest. Q. How has the body language changed? WAQAR YOUNIS: Body language of the team? Look, it definitely changed because to win always makes you feel comfortable and makes you feel confident. But I still feel that we need to win against a bigger opponent to really tell the world that we're around. Two victories, fair enough. The run-rate is better. We are sneaking in, so we're just looking to play a better cricket, but, yeah, we need to beat a bigger opponent. Q. You played in a time where you had terrific players and you were also able to raise your game for the really important matches. You talk about South Africa, for example, prime case. What do you see in your squad here that encourages you that they have got it within themselves, the character, the will, the spirit, whatever, to lift themselves for a big occasion like South Africa? WAQAR YOUNIS: Look, we maybe not at the moment you might not be able to see it to be thinking that we haven't played the best of the cricket but we have played, we've beaten Australia just recently. Capability is there. Fair enough we are missing a couple of our key players just recently, and that's really given us a setback. But we have got the capability. We've got players that can turn it around. The tournament's going to get tougher and tough, and we have to be ready for it.